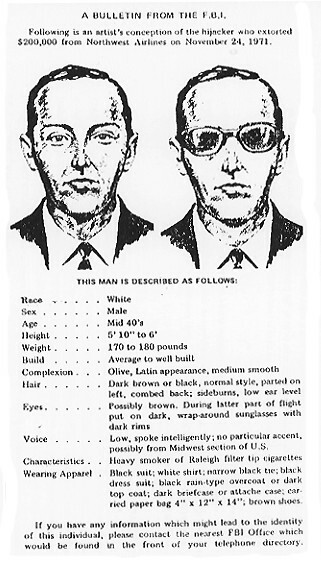 A man identifying himself as Dan Cooper — later mistakenly identified as D.B. Cooper — boarded a Northwest Orient Boeing 727 on a flight from Portland, Ore to Seattle, Wash, in November 1971. Once the flight was airborne he passed a note to a stewardess claiming he had a bomb and then opened his briefcase showing her what appeared to be a bomb. Mr. Cooper then ordered the plane to land in Seattle, where he allowed the thirty-six passengers to exit the plane in exchange for four parachutes and $200,000. Then he, the pilot, co-pilot and one stewardess took off again. He demanded the plane fly south to Mexico, but to stay below 10,000 feet. Then over the lower Cascade mountains, 25 miles north west of Portland, Cooper released the plane’s aft stairs, stepped out, and, with one of the parachutes strapped to his back, jumped into the freezing night and was never seen or heard from again. 40 years later, the Federal Bureau of Investigation has received what they believe to be a new and credible tip. The tip has lead to a new suspect, a suspect whose name has never surfaced before. Fred Gutt, a special agent in the Seattle office of the F.B.I., told The New York Times on Monday that the suspect died 10 years ago. He said the tip came from a retired law enforcement officer who knew a witness who “had an association with” the suspect from long ago.